The Amazing Stroll: A purrrrfect setting! Actually, this is what House Sitting feels like. Spending a month in a quaint little apartment in the Barceloneta area of Barcelona, Spain, chilling every morning in your PJ’s with two wonderful cats nuzzled against you! That’s the kind of travel we prefer now. Slow travels, where you stay put in one spot for a while and let the surroundings and its people open up to you. The Amazing Stroll: Where's Waldo? The pace is so rapid and impersonal that you end up feeling like you need a vacation from your vacation because your body and mind are pooped! If this depicts your travel reality, don’t feel too bad, we ourselves did this “cattle herding” travel for many years (can you say four countries and two continents in one month?). We’ve sworn off that formula. Nowadays every popular spot seem overtaken by tourists. Now don’t get me wrong, everyone’s entitled to indulge in the luxury of travelling abroad, the problem resides with the people running the attractions. Luang Prabang, Laos in spring of 2017. The Amazing Stroll: Let's go watch the sunset! One of the main attractions is to watch the sunset from the top of Mount Phousi. For the experience to be memorable, they would have to cap the number of participants at about 250 people. Because there is money to be made, a far greater number of entry tickets are sold. We guessed that there must have been at least 500 people, if not more. It’s so overcrowded that you can’t even reach the top of the mount, let alone see a glimpse of the sunset! The Amazing Stroll: Mad dash to the top! Unfortunately, we’ve noticed over the years that this type of practice is widespread at practically all the tourist attractions. They do it because they can get away with it. No matter what, every day there’s going to be a beeline of buses, unleashing another herd of tourists. And dollars. It doesn’t mean we’ll never visit such an attraction ever again (I HAVE to see the Roman Coliseum one day! ), we just won’t make the attractions the focal point of our travels anymore. Some of our most memorable moments are not the attractions we’ve visited but the connections we’ve made along the way. When reminiscing about our travels, we talk about how we felt when we looked after a pet that we bonded with. We talk about the friends we made in Madeira who asked us to join them when going to the movies or to the carnival. 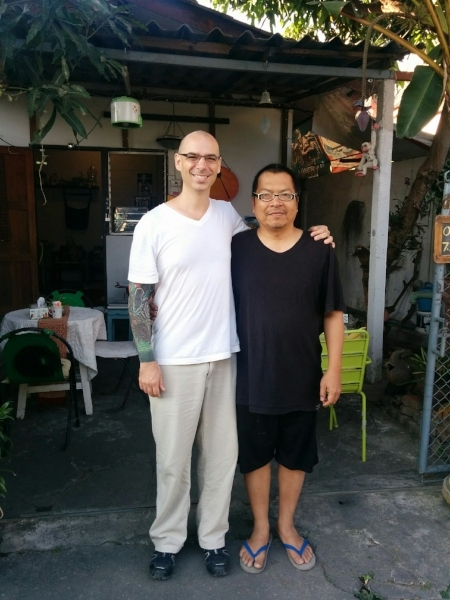 The sculptor I befriended in Thailand that would meet me for coffee every morning to talk about Thailand, Canada, art and life. The Amazing Stroll: We meet at last! House Sitting consists of Homeowners in need of people (House Sitters) to care for their home and pets when they leave for a predetermined period of time in exchange for free accommodations. No financial transactions are involved. Just like-minded people, who care about the wellbeing of homes and animals, helping each other out based on the age-old bond of trust and mutual respect. As wonderful as it might seem, it requires a serious commitment from both parties for this system to work. Homeowners are expected to provide a clean, safe living environment, to be upfront about their expectations/requirements and be thorough when it comes to services, locations and transportation available in their area. House sitters must first and foremost love animals. Rare are House Sitting assignments that don’t involve caring for animals. Homeowners want peace of mind that their pets will get love and attention from their House Sitter as if it was their own. In our case, you show us a newborn baby and a kitten and watch us loose our minds over the kitten! If that describes you, then you’ll fit right in within the House Sitting community (of course it’s OK to love both!). The Amazing Stroll: OMG!! A kitten! House sitters are also expected to be respectful of the Homeowner’s home. As obvious as it may seem, keeping the place clean, de-cluttered and well maintained is mandatory. Slobs need not apply. We’ll provide more insight and detail on that in a future post. As you can see, this isn’t just about getting a security guard for the Homeowners or scoring free accommodations for the Travelers, it’s about social interactions. Very often everyone involved stay in touch long after the House Sitting assignment is completed. The Amazing Stroll: You missed out! Let’s debunk something. Although a lot of House Sitters do this full time and have embraced a nomadic lifestyle, it isn’t a prerequisite in order to give this a try. House Sitting assignments come in a variety of duration from a variety of locations. Assignments can be for as short as two, three days or as long as two, three months or even up to a year or more. They can be found on any continent or even within your own city. Although we all dream of House Sitting assignments in Hawaii, don’t be too hasty in dismissing local assignments as they are great for all parties involved. Homeowners can meet their future House Sitters in advance and introduce them to their pets prior to their vacation. House Sitters can build their references (link to article about building a portfolio) by doing a lot of local sits. I’ve even heard of Homeowners and House Sitters agreeing to let the Sitters’ children take care of the pets under supervision as a way to gage if they are ready to have a pet of their own. So now you know a little bit more about House Sitting. Is this something that’s suited for you? Those who think it’s a good fit, I’ll be with you in a minute. However, if you’re thinking: screw that, I’d rather book a cruise or a resort! No worries… we can still remain friends. We invite you to go explore other categories from our blog menu. There’s sure to be something in there that you’ll benefit from. Go learn about travel destinations in Road Stories. 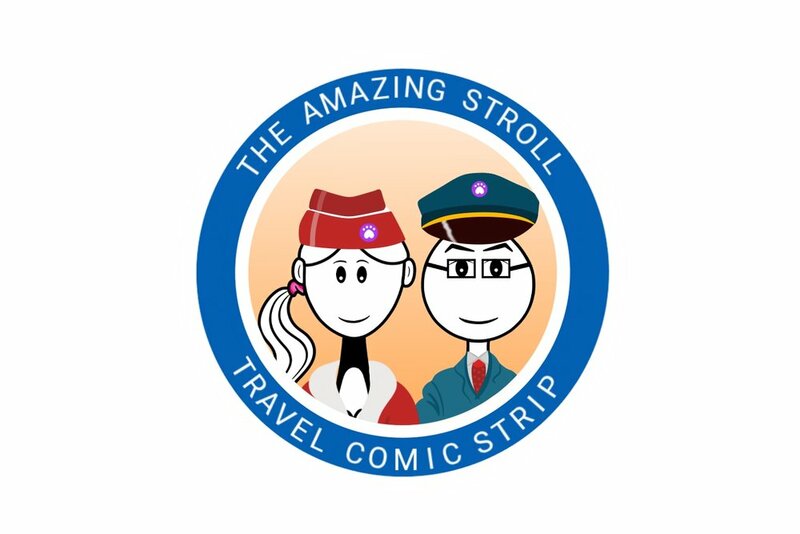 The Amazing Stroll: Come laugh at our expense! Now go browse, I’ll talk with the others. Alright… whoever’s left, gather ‘round. We have a series of posts in the House Sitting category from our blog’s menu. We cover the House Sitting Community, How to Build a Profile, How to Apply on Assignments, How to Interview, and anything else that can be helpful along the way. If after reading all of these you’re still left with some questions, just get in touch with us and we’ll be happy to help! Now if you’ll excuse us, we’ve got a plane to catch!